In our garage door insulation guide you will find all the needed materials, cost of materials and best DIY tips for the job! An uninsulated garage will cost you a lot of money during the winter and summer months. This is due to energy loss that occurs when a large area is not insulated properly. High cost is what keeps people away from getting their insulation done properly, but with a DIY project the cost goes down dramatically. You gain a lot of advantages from the install, and the best part is that it isn’t a huge time commitment. If done right, any remaining materials can be used to insulate other parts of the home. So this is the one project that is worth the effort to get right the first time. On most homes, the garage door is a big part of the design. It is the biggest part of your home when it is in the front, but beyond the design it has an important purpose. This is the largest opening to your home, so just like a front door, you want to make sure it is functioning properly. Weak garage doors and insulation make your entire house vulnerable, with the biggest problem being the air that passes through. You’re air conditioning unit will work overtime to keep a set temperature, fighting the weak garage door that is constantly changing the home environment. Having a competent garage door insulation is a necessary barrier to keep you’re a/c costs down. You can shave 90% of the cost by doing the project yourself. Leftover materials can be used for insulation elsewhere in the home. Save money on your electric bill since the insulation stops the a/c from overcompensating. This works for warm and cold months. Insulation also acts as a noise absorbent, lowering loud sounds that disturbs others. If you do projects in your garage this will help so that the rest of the house isn’t bothered by the extra noise. All of your changes won’t affect the design of the garage door. You can add as much insulation as you want without altering its appearance. Depending on the size of your garage, the project can be tedious. The time needed isn’t high, but there is a lot of repetitive tasks until it’s completed. Foam boards will need to be replaced over time if they don’t have a weather seal. This is a big deal, so it is recommended to use strong materials upfront. When doing the project, you have to account for the extra weight the insulation will put on the door. If the mechanics are weak, it may have trouble opening even with minor weight added. The project is low priced, but the actual materials can be high in price depending on what you want. Stronger materials will drive the project cost a lot higher than you’d expect. The only thing that will really set you back is the quality of the material you use for insulation. This will be your biggest cost or lowest based on what you purchase upfront. Not a lot of tools/materials are needed, and you can count on some leftover materials being useful for other projects. No matter the scale of this DIY garage door insulation, it doesn’t become more complicated even with larger installs. Insulation Panels – You can go with any type that you feel is the best for this portion. Remember that whatever panels you choose, this will be what stands between your garage door and air getting in your home. Out of all the materials listed, this is the one where that should have the most money invested in it. Retainer Clips – They are poplar enough that you can often find them by the name “Garage Door Insulation Retainer Clip” or other variations with that same format. You won’t get the wrong clip by not getting this specific type, but it helps so that you don’t have to guess whether the clip can be used for insulation. Double-Stick Adhesive – There are plenty of popular brands that stand out here. Even Gorilla Glue has made their own double-stick adhesives. The only thing that matters is that the product is strong, reliable and can hold up for years at a time. Straightedge/Tape Measure – You’ll need both for measuring, but nothing too fancy. They’ll get the job done as long as they get the numbers right. Respirator Mask/Rubber Gloves – When working around areas that are susceptible to mold and dirt, these protective materials work the best. It is important to not skip out on wearing protection while doing this project. Utility Knife – There will be a lot of precise cutting, so choose something that is comfortable. It also helps if the blades are sharp or removable. Length doesn’t really matter unless you plan on using thick material. Once you have all of the materials and a solid plan, installing the insulation is just a matter of following simple directions. More patience than skill is required to finish this project, with repetitious tasks being the biggest pain. You can cut down on work time by getting the garage door measurements right. This is the biggest problem for a lot of users, and it often leads to wasted time. While you’re doing measurements, check for other problems. A bigger issue with your garage door may require your attention before moving forward with the project. Measure the height and the width of your garage door panel to get accurate numbers for the retainer clips. They will be placed at each mark you put on the panel, so make sure that everything matches up. Larger panels will need more than one retainer clip, so make adjustments as you go along. It is better to have more than less in this case, so starting out with a lot of retainer clips is helpful. The next step is to cut the insulation in the sizes, using the numbers collected from the panel measurements. Make sure to add a few inches to the height/width of your original numbers so that it fits better. You don’t need to go too crazy with this, it is just about getting the sizing right. Now comes the tedious part; put the insulation into the garage door panel, and then secure it with the retainer clip. Use your utility knife to poke a hole in the insulation so that the retainer clip isn’t a hassle when locking. The utility knife from the materials list will do the job just fine, but some users prefer using different tools for this part of the job. Either way will work fine, and it doesn’t matter what you poke holes with. Continue to do this until your garage door is complete insulated from top to bottom. The steps for installing the insulation is simple enough, so why do a lot of people have problems with the project? It all boils down to getting the measurements right so that you don’t have to backtrack and redo specific parts of the project. Get the measurements right the first time, or else you’ll have to redo both the retainer clips and insulation. If you have a big garage door, this will become a time consuming process. There is nothing wrong with purchasing prebuilt insulation kits from major stores. They have everything you need in one package. The only thing you will have to do is cut and measure. Everyone isn’t comfortable using the utility knife to poke holes in the insulation. You can use any tool you want to get this part of the job done. Precision isn’t required, so it is more beneficial to go with speed and comfort. Cheap insulation won’t do the job right. You want as great a seal as possible when you do your own insulation. Cheap materials will get you less than stellar results. Insulation for garage doors has an R-Value. This rates how good the insulation is for a particular material. Use this rating to determine the effectiveness of the material you buy for the project. Don’t use Styrofoam for insulation material. While it has a nice effect on the rest of the home, Styrofoam tends to be a problem when used on garage doors. This has to do with it the material trapping hot air in the garage, making the entire area a breeding ground for mold. 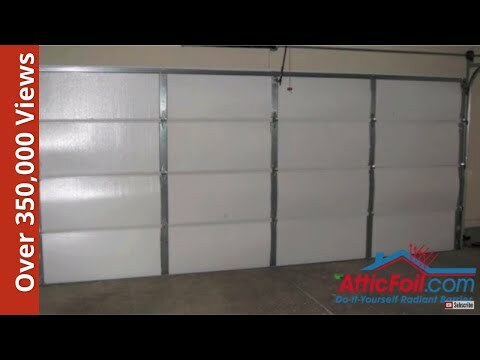 Entire garage doors can be purchased with insulation built in, but this is an expensive option. If you’re having troubles getting your project to work with the material, built in insulation may be the answer. This is only an issue with the current garage door has issues opening or closing after the project. Consider insulating your garage from the home. That means doing the ceiling, walls and even the floor. This is extra work but is worth the effort when you want to maximize the effectiveness of insulation. Unlike other home additions, you don’t need to get any special permission to add insulation to your garage door. When deciding between this and a more ambitious project, remember that insulation saves you money in the long run. You’re going to spend hundreds of dollars less on this project by doing it yourself. Make sure to place a priority on insulation materials above everything else. Bad material will make the job a failure before it even starts. What Is The Most Common Garage Door Insulation Material? Most homes will are fitted with fiberglass, foam, polystyrene foam or reflective foil. They rank as the most used insulation materials, although foil is more likely in older homes. Reflective foil is the cheapest, and is sold in rolls. The downside is that it looks bad compared to the other materials. Polystyrene foam is rigid and tough to deal with when cutting. But is it is also fantastic with insulation, having few equals among the other materials. Foam hybrids and fiberglass are the last two, and they both are solid choices. In modern times, foam hybrids and polystyrene foam are the most purchased materials for garage door insulation. Can The Project Be Done By One Person? Yes, although larger garage doors will take time. To keep from getting burned out during the project, you should break it up into two or three days. One day for measurements and cutting, and the other days for applying the insulation. The break in-between measurements will give you more than enough time to figure out what type of insulation material works best for the project.